With just a few hours of daylight left this evening, we decided to head to Druridge Pools in case we could add a final new bird. 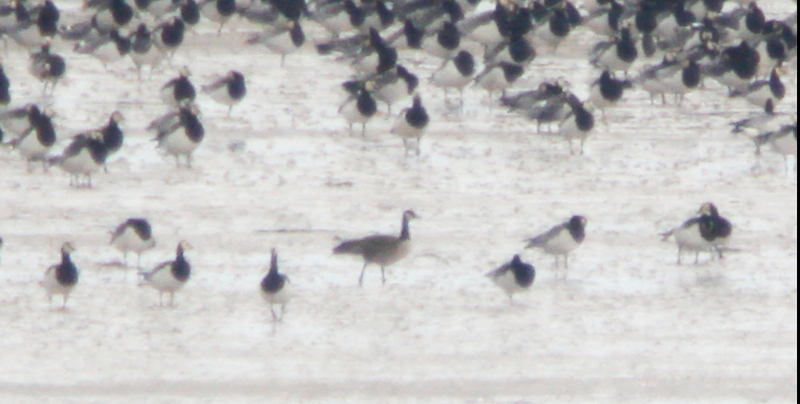 A look off the dunes was very quiet and it was largely the same from the screen, although 7 Black-tailed Godwits were new. 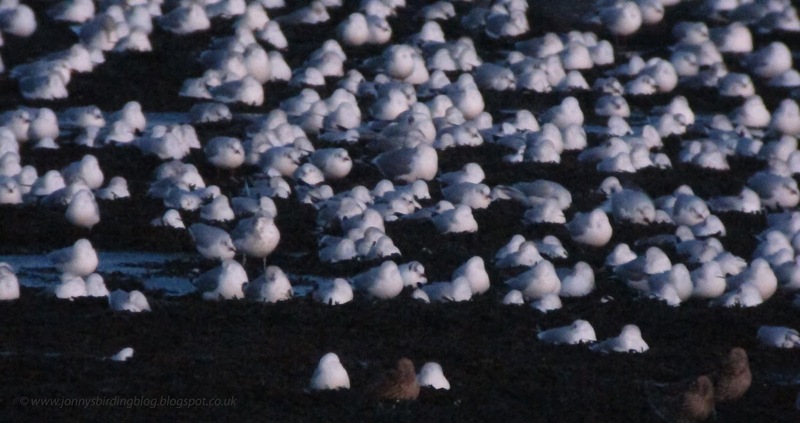 We just arrived back at the car to head to Chevington when I checked my phone and was pretty surprised to see that a Ross's Gull found at Boulmer! The sun had already set but we still thought we could make it, especially with the head start we got from already being at Druridge. We arrived about half an hour later and then ran as fast as we could from the village to Longhougton Steel about 800 metres to the north. At first it wasn't looking good, the light was going fast and the bird had disappeared into the flock of hundreds of gulls, many of which were sat down or behind the rocks. 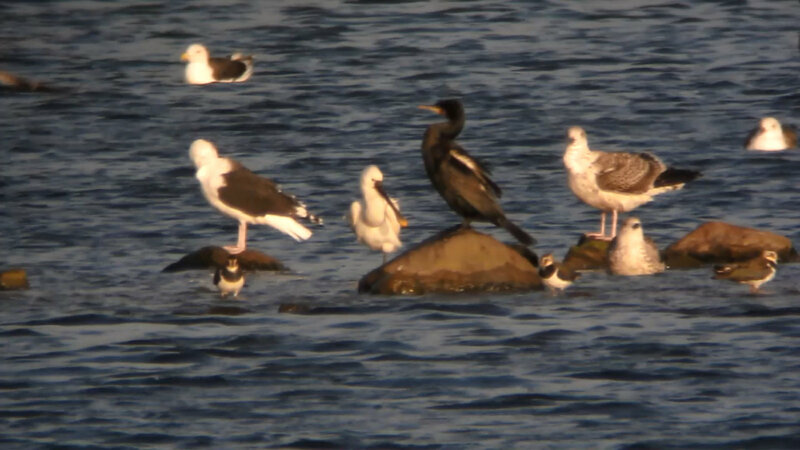 Luckily though I was scanning through the flock when something about one of the gulls caught my attention. 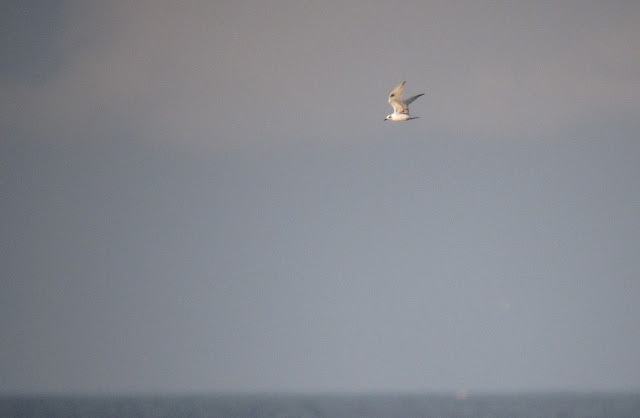 Just I got onto to it, it took off revealing the stunning plumage and structure of the adult Ross's Gull. Thankfully it dropped back into the flock where it stayed until the light finally went. 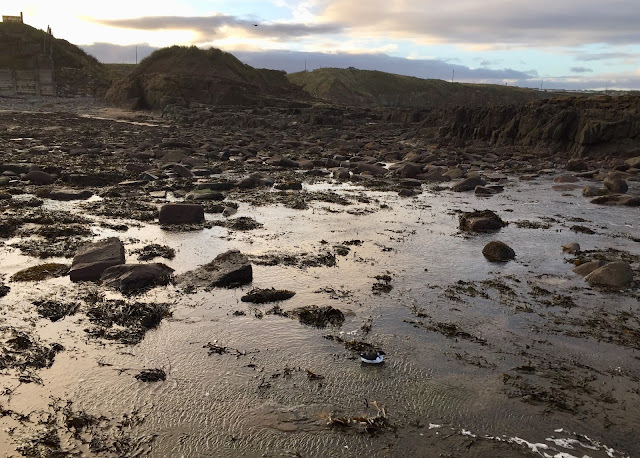 What a way to end 2017! 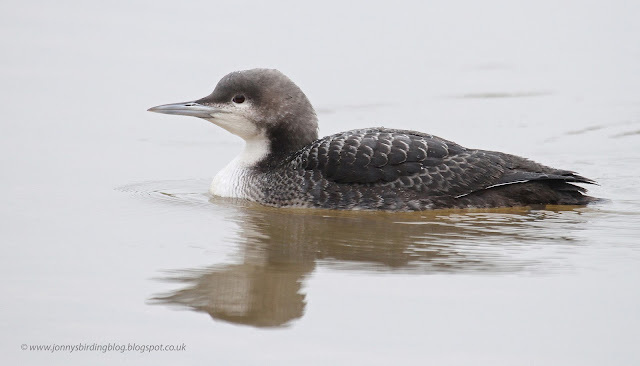 Pacific Diver at Druridge Bay Country Park - my first lifer of the year and the first of just three 'BB' rarities we saw in Northumberland this year. 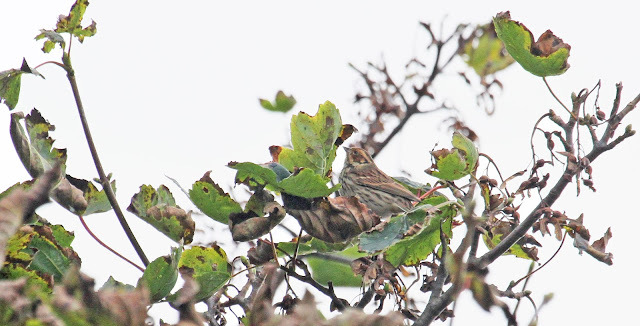 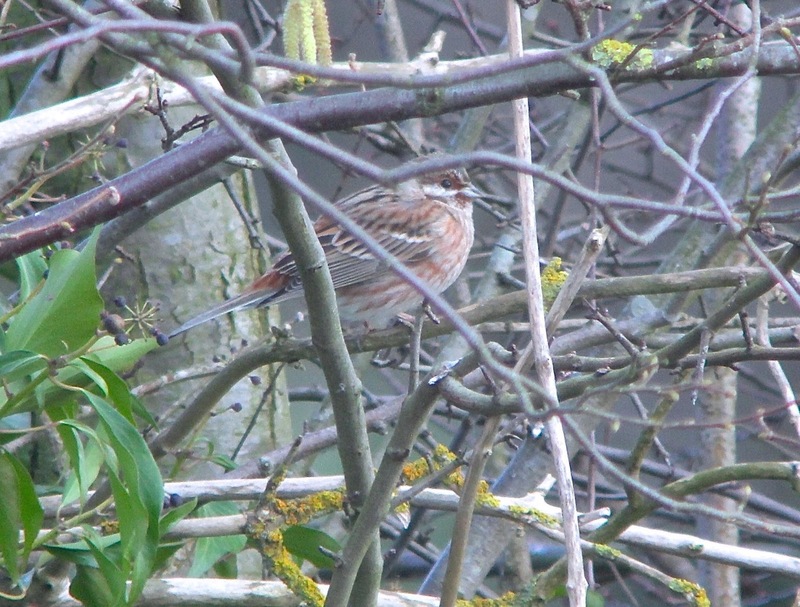 Pine Bunting at Dunnington (N. Yorks) © S. Clifton - a very successful twitch for this smart bird in late February. 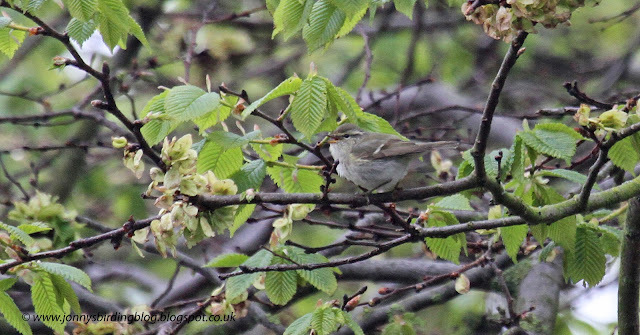 Yellow-browed Warbler on Holy Island - this singing male was perhaps our most unusual find of the year. 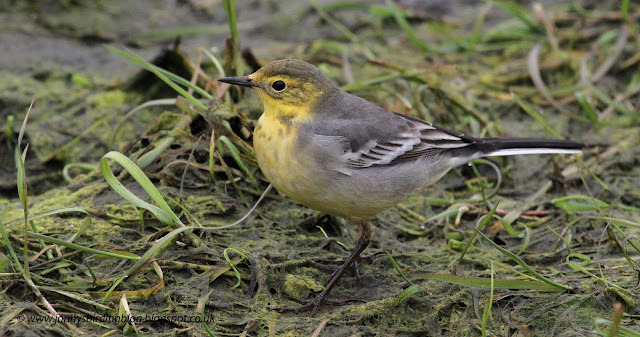 Citrine Wagtail at Lynemouth Flash - bird of the spring and a serious contender for bird of the year. 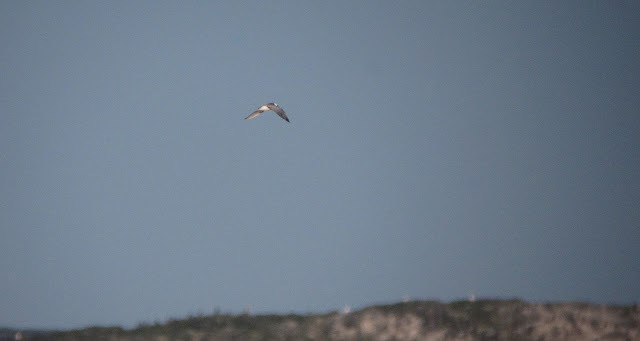 Audouin's Gulls on Mallorca - perhaps my favourite bird of the trip. Other highlights included Balearic and Moustached Warblers, Black, Griffon and Egyptian Vultures, Tawny Pipits, a Scops Owl and an extremely confiding Little Bittern. 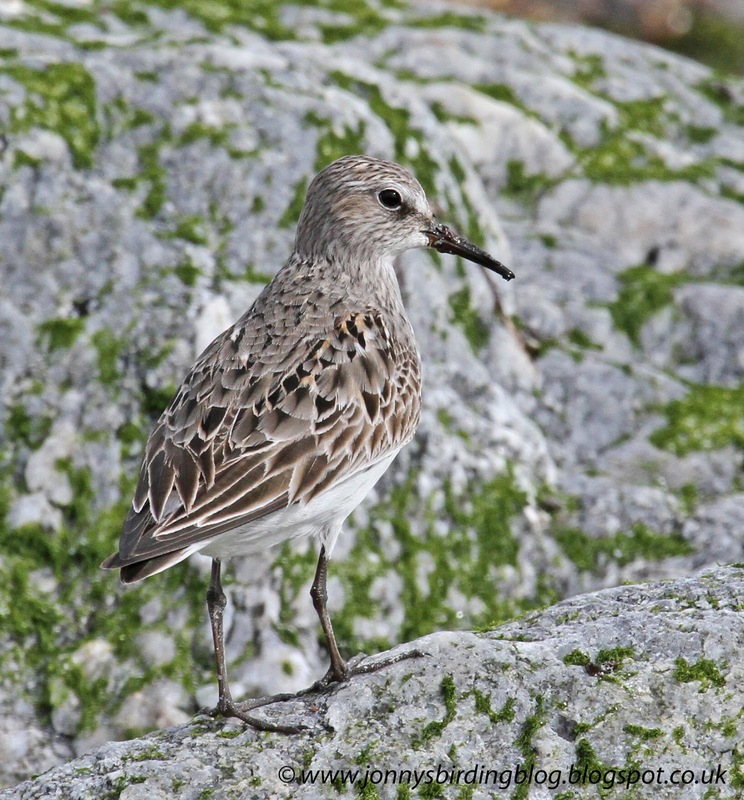 White-rumped Sandpiper on North Uist - it was great to find this then have views down to just two or three metres at the scenic RSPB Balnarald. 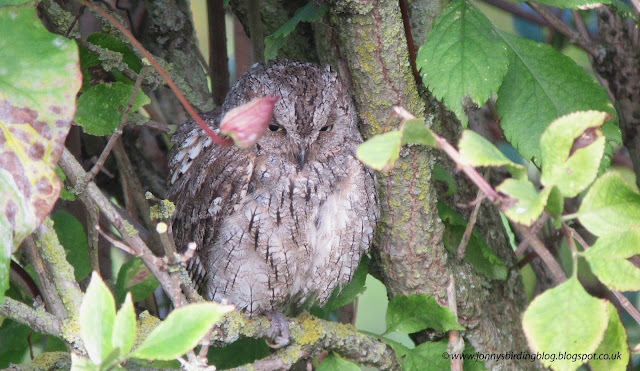 Scops Owl at Ryhope - my rarity of the year. 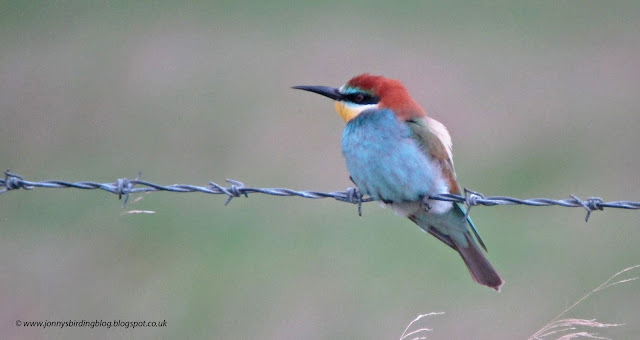 Bee-eater at Druridge Pools - almost certainly one of two Bee-eaters we had flying over East Chevington the weekend before which were definitely our most exciting find of the year! 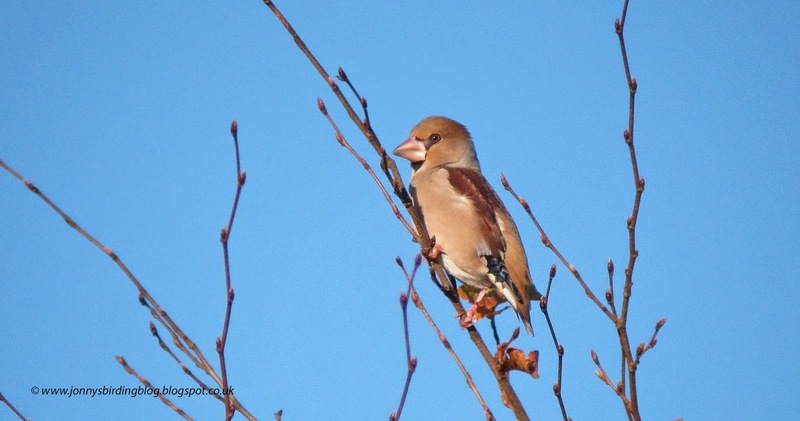 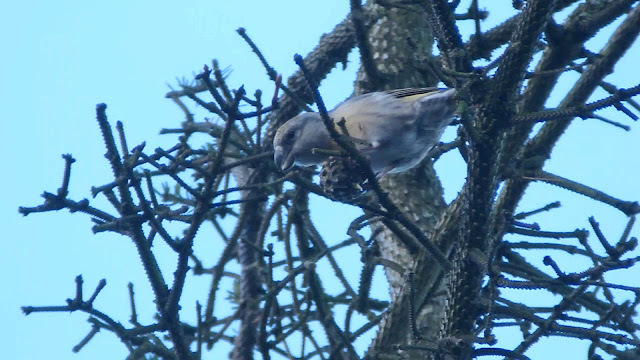 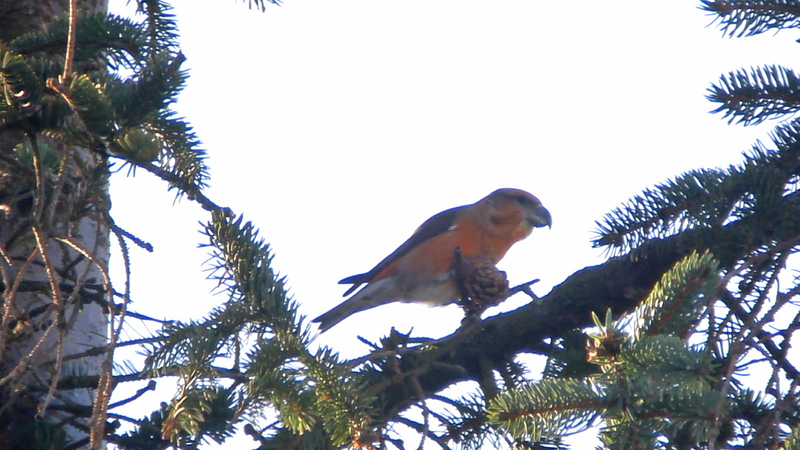 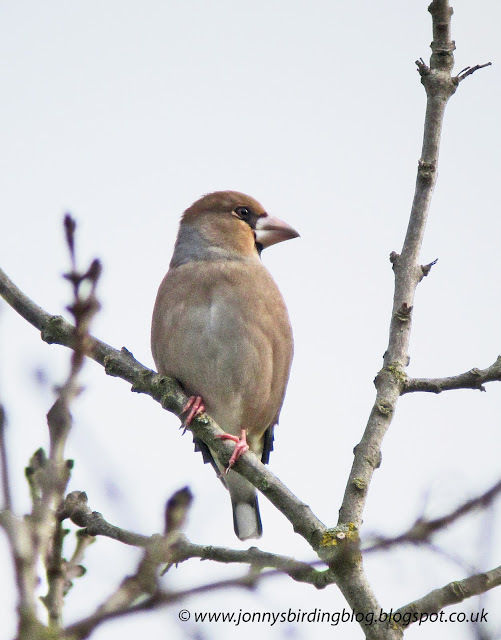 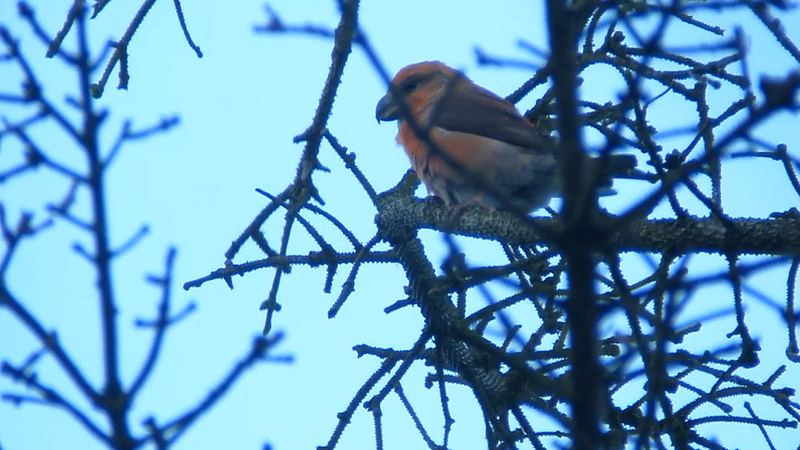 Hawfinch in Morpeth - just my second sighting in the county. Little Auk at Snab Point - great to get good views of this bird which briefly landed on the end of Snab Point. 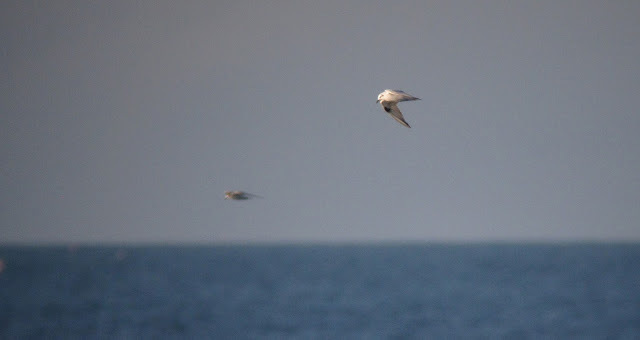 Other seawatching highlights throughout the year included 2 White-billed Divers, Cory's Shearwater, Sabine's Gull, 2 Grey Phalaropes and a Storm Petrel. 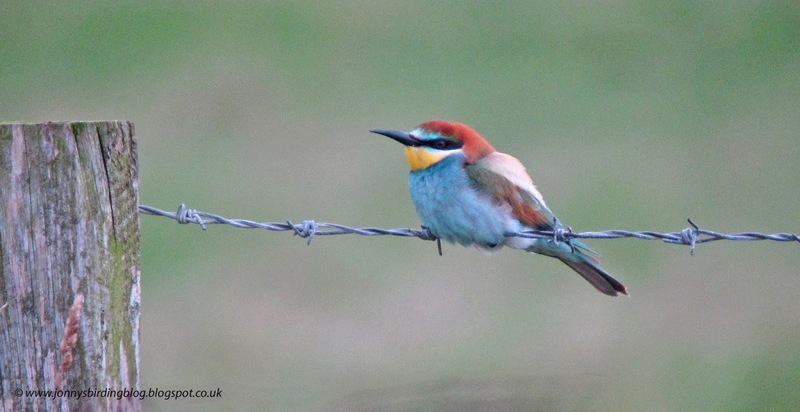 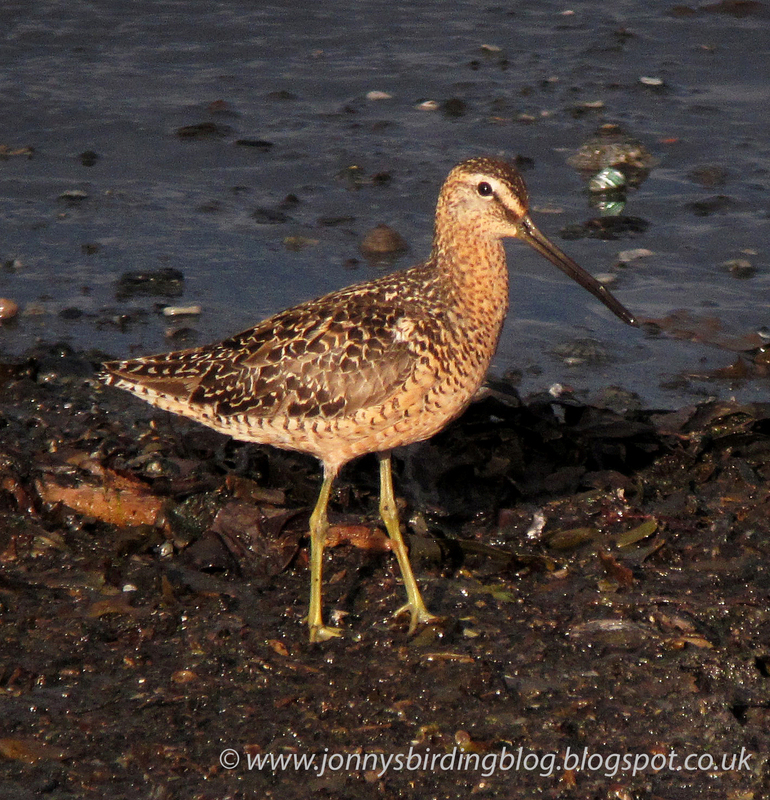 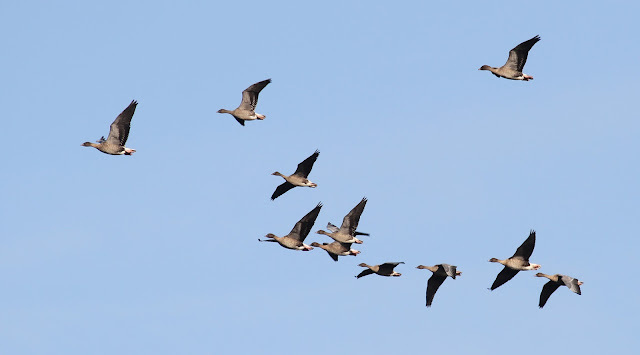 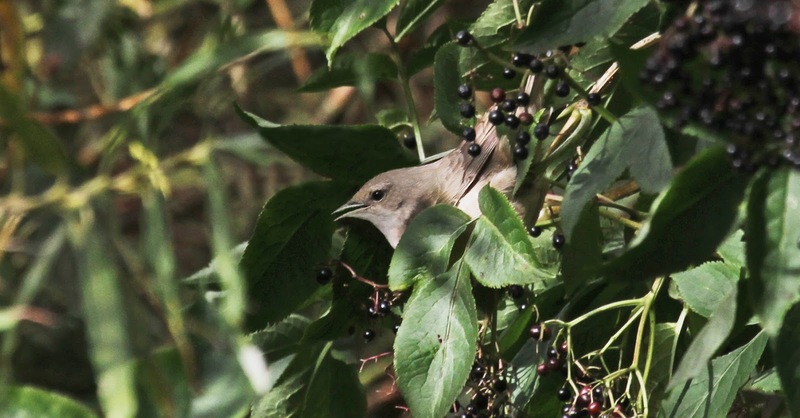 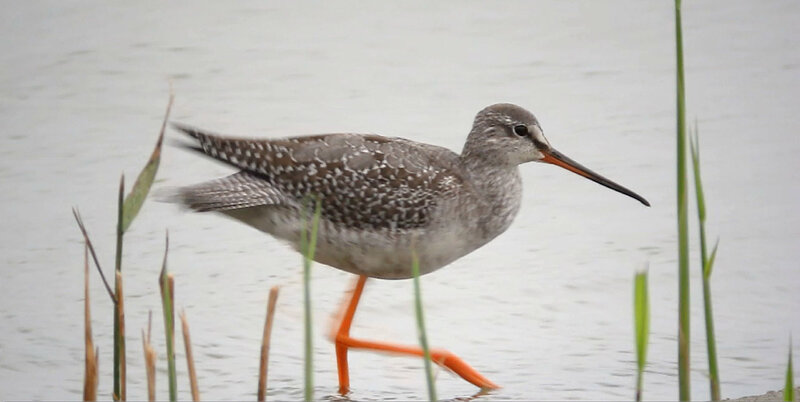 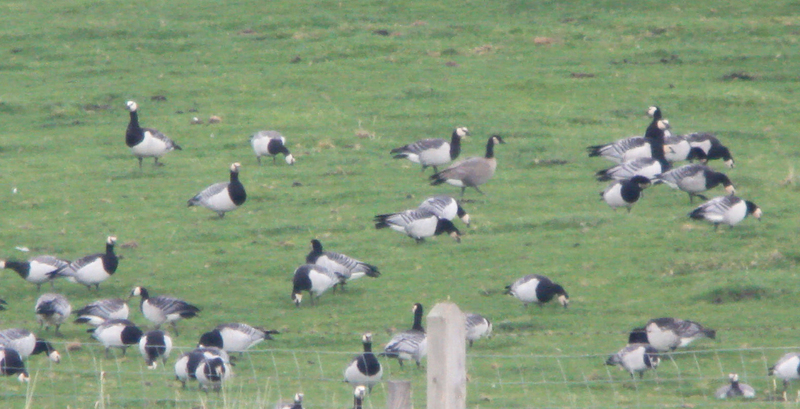 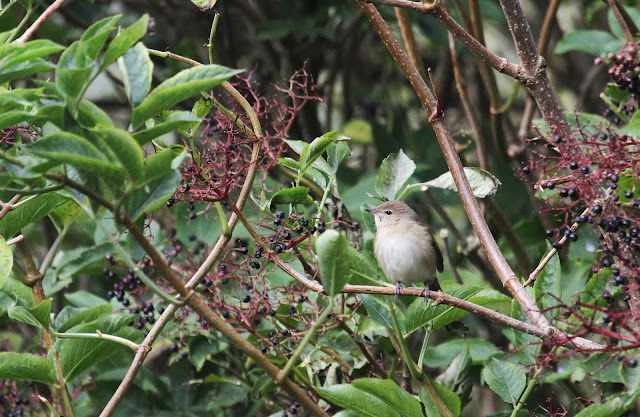 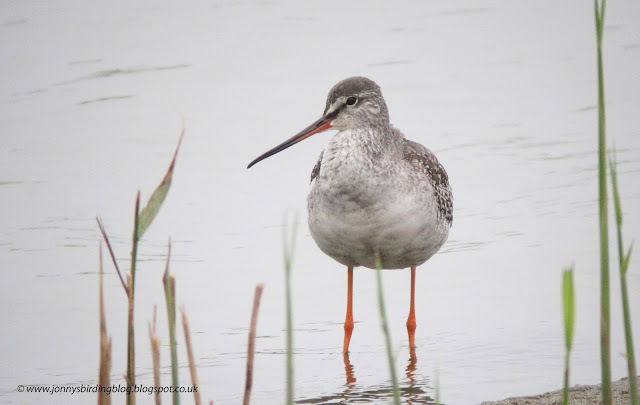 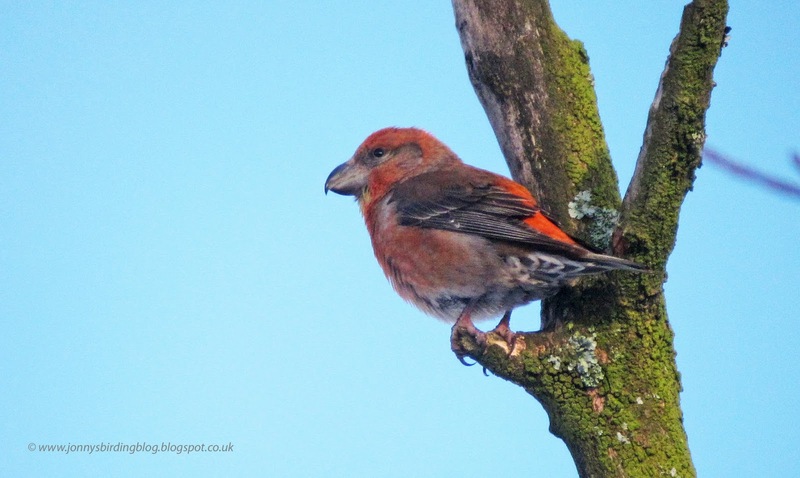 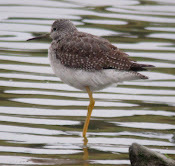 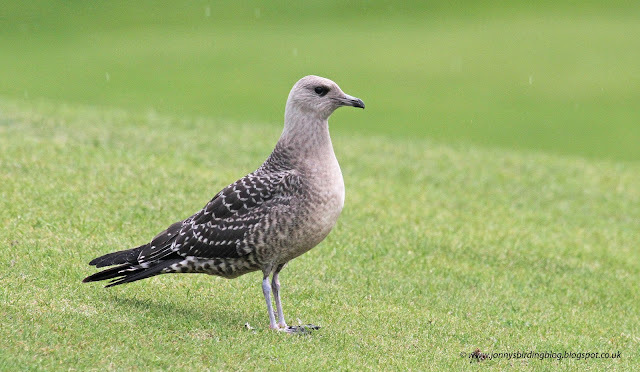 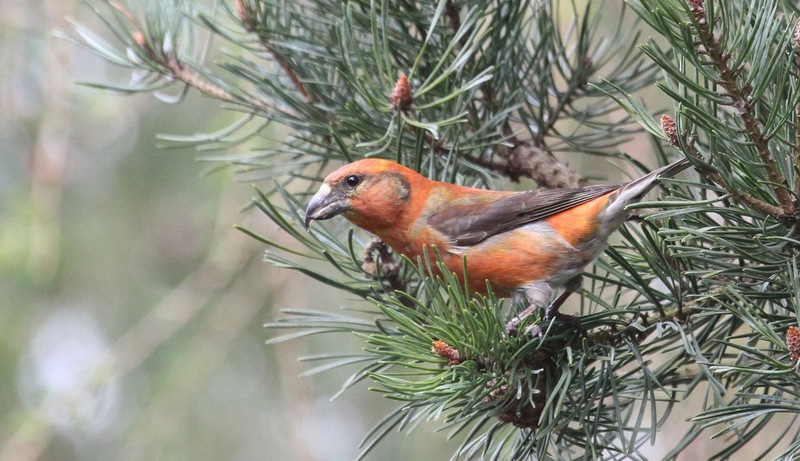 We've another really lucky year in terms of finding birds. The singing Yellow-browed Warbler was the best of the spring, while the autumn was more productive with White-rumped Sandpiper on North Uist, 2 Pectoral Sandpipers, Sabine's Gull, Quail, Bee-eaters at Chevington and Grey Phalarope. 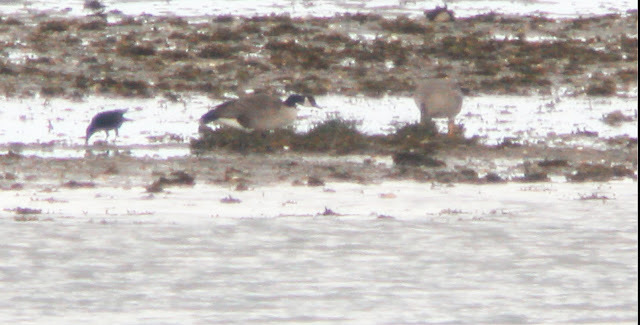 It was also nice to finally fill the hole of Garganey on my finds list! I've just passed 200,000 blog views so thanks to everyone who reads it! 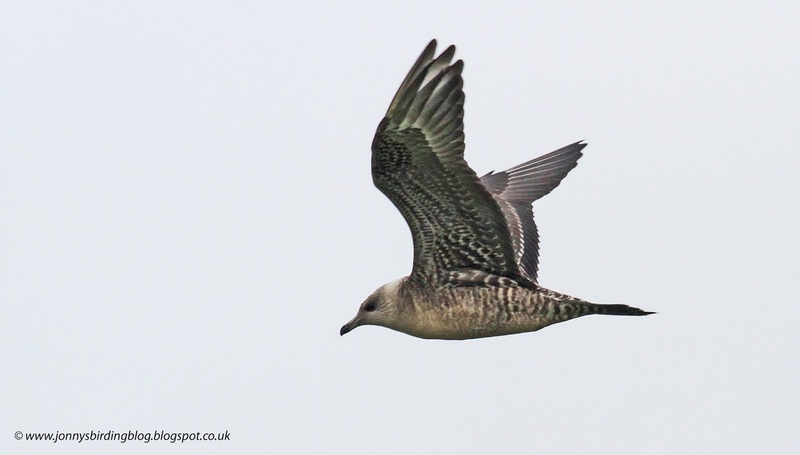 We've had a good run of seawatching this year with highlights up to today including Cory's Shearwater, Sabine's Gull, Storm Petrel and two White-billed Divers. 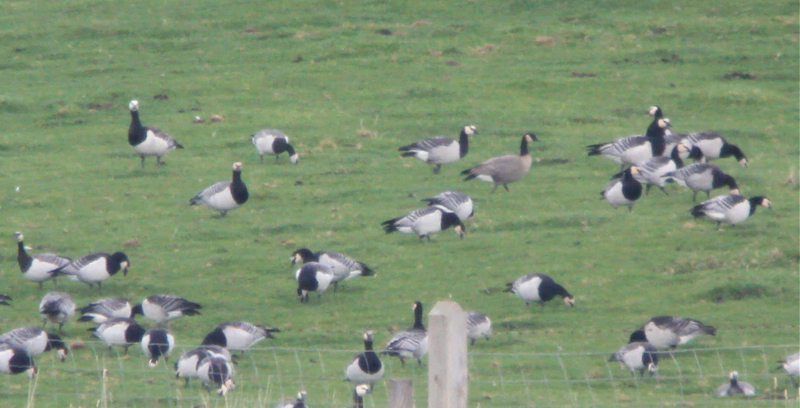 We weren't as hopeful about today when we set off this morning, but were pleased to be proved wrong in the end! 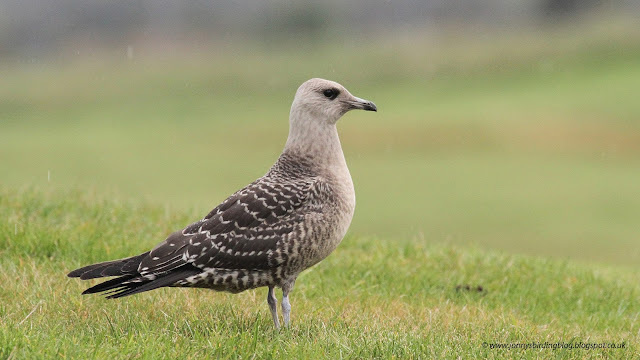 We then took a break for lunch and checked a quiet Druridge Pools before deciding to have another look at the sea from Snab Point. 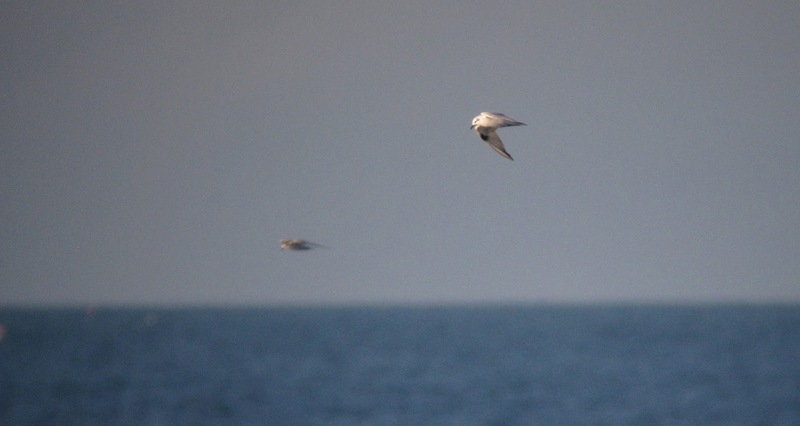 With rougher seas and the wind coming more from the north, our two and a half hours here were much more productive. There were a few more Little Auks passing now and I got onto a distant Grey Phalarope which kept on disappearing behind waves. A second-winter Glaucous Gull suddenly appeared over the rocks and was close enough to make out the pale iris through binoculars. 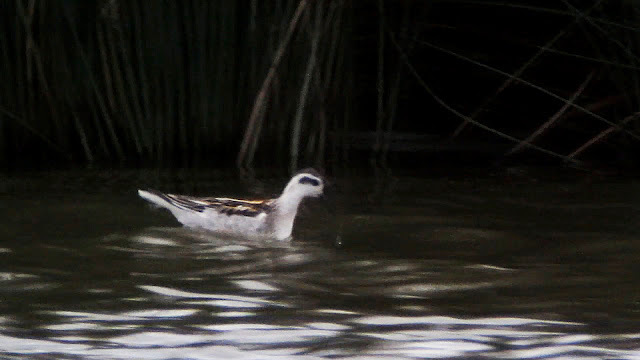 The Grey Phalarope reappeared much closer feeding in the surf and a second more distant bird flew north at speed shortly afterwards. After one had been seen earlier I was pleased to now be able add it to my finds list. Another finds tick for me came shortly afterwards when I picked up a lark flying straight towards us at distance. Despite the long range, its pale face was visible and as it got closer we could see that it lacked a white-trailing edge to the wings, confirming it as a Shore Lark. 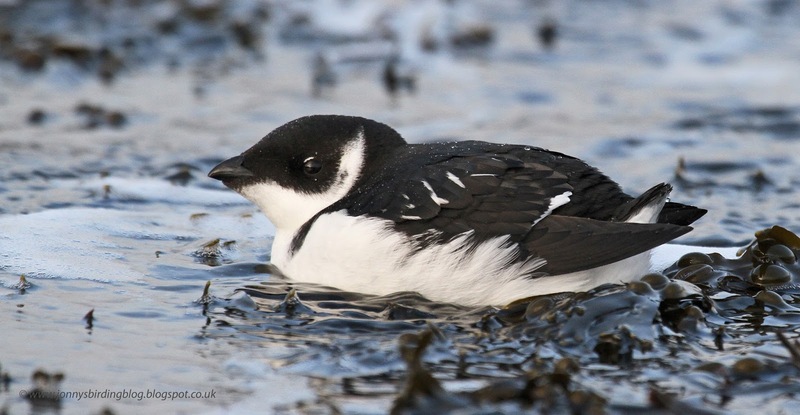 Little Auk - second photo taken on my phone without any zoom!